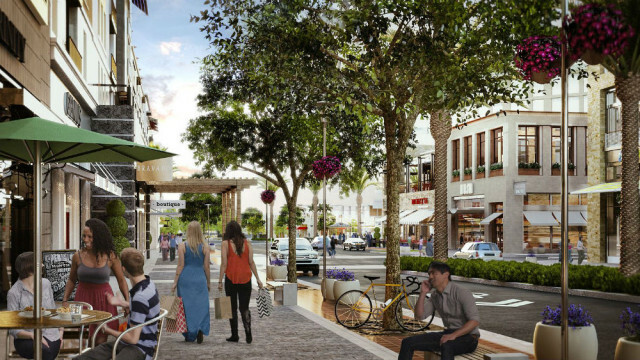 After being forced back to the drawing board, the developers of the One Paseo project in Carmel Valley are scheduled to return to the San Diego City Council for a public hearing next week, council President Sherri Lightner announced Monday. The City Council gave the mixed-use project — on an empty 23.6-acre lot south of Del Mar Heights Road, between El Camino Real and High Bluff Drive — its backing early last year but opponents collected enough signatures to force the approval to be rescinded. Opponents were concerned that the project’s density would worsen traffic in an already congested part of town. Developer Kilroy Realty says the new design would attract half the daily vehicle trips of the original plan, increase setbacks from main roads and improve landscaping. The plan incorporates 608 housing units, 280,000 square feet of office space and 95,000 square feet of retail. The number of housing units is the same as the original project, but proposed office and retail space is down by more than half. The hearing is scheduled to begin at the unusual time of 1 p.m., and will take place at Golden Hall to accommodate an expected large crowd.